It’s here! I’m so excited to be bringing you this long awaited for eBook. I started this project a couple of years ago based on my 31 Days miniseries. *This post contains affiliate links. If you click on a link and make a purchase, I may receive a commission at no additional cost to you. You can read the disclosure here. :: Do you feel overwhelmed with your role as mother, wife or homemaker? :: Do you compare yourself to the neighbor lady who seems perfect? :: Do you want to succeed in your God given roles? Answered Yes To Any Of The Above? Then 31 Days Is For You! Are you are busy woman and you are afraid you won’t have time for 31 Days of reading? Don’t worry. Each chapter is short and to the point. Consider this book a daily devotional broken up into bite sized pieces for the busy mom, wife and woman! Buy 31 Days and help get the school year off on the right foot! :: Offers daily encouragement for you! I understand the craziness of life. That is why I created an eBook just for us. This eBook will help you focus your attention on your husband, your family and most importantly, the woman God wants you to be. 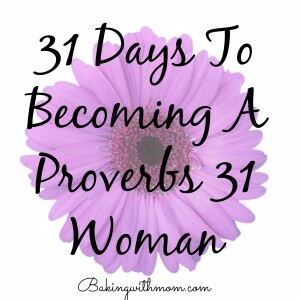 Each verse in Proverbs 31:10-31 focuses on how we, as woman, can tend to our homes. We aren’t perfect, and our homes aren’t going to be either, but we can dedicate ourselves to our families and their needs. One day at a time. You can go here to buy the eBook on Amazon and read on your Kindle! Don’t have a Kindle? That is okay! You can download this FREE app so you can read this eBook (and all other eBooks on your PC). Read eBooks using the FREE Kindle Reading App on Most Devices . You are capable of this task of womanhood. You are capable of loving your husband and serving your children. You are capable of growing in the Lord, all by His grace. Learn the tools on how. Start today.